The patch program is designed for groups such as Boy Scouts, Girl Scouts and Camp Fire. 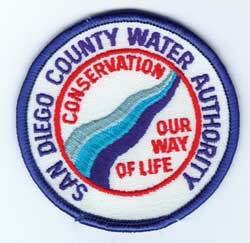 Program requirements are designed to teach children about their water supply and conservation. Upon completion, each group member will receive a certificate and an embroidered patch. TO PARTICIPATE: More information is on the Patch Program webpage. 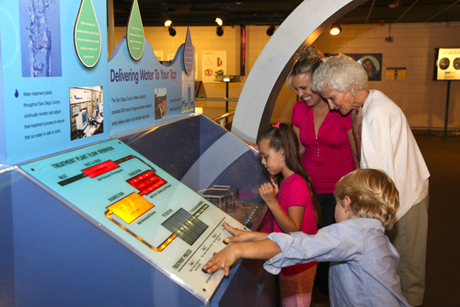 The Water Authority’s exhibit at the Fleet Science Center engages students of all ages in activities about water supplies and conservation. It explores ways to save water at home, as well as the importance of stormwater and water recycling. Students also learn about how conserving water conserves energy. COST: For hours and fee information at The Fleet Science Center, call (619) 238-1233 or go to www.rhfleet.org. The Water Authority offers awards of $100 to $300 for outstanding water-related entries at the Greater San Diego Science and Engineering Fair. Prizes are awarded each year to winners in both junior and senior divisions and presented to the students at a Water Authority Board meeting. ​COST: The Greater San Diego Science and Engineering Fair charges a fee to participate. Go to www.gsdsef.org for information. TO ENTER: All water-related projects entered in the Greater San Diego Science & Engineering Fair will automatically be considered for the Water Authority’s awards. For Information: Contact Ashley Jenkins at ajenkins@sdcwa.org.